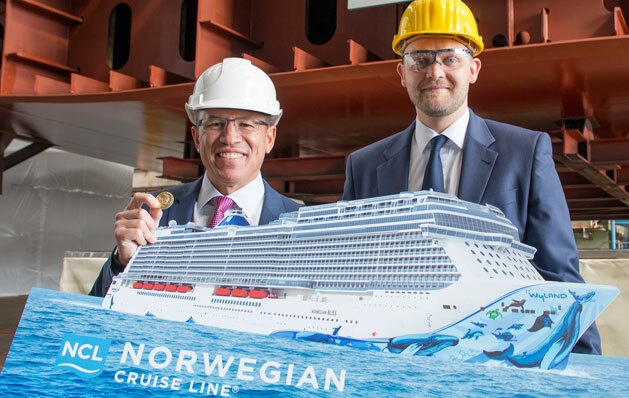 Andy Stuart, Norwegian Cruise Line’s President and CEO, celebrated the start of construction of Norwegian Bliss with a traditional “lucky coin” keel laying ceremony. This involved setting one of the keel blocks of the 167,800 gross-ton vessel into the covered building hall – marking a major milestone in the Norwegian Bliss’ construction. Together with Tim Meyer, Managing Director of MEYER WERFT in Papenburg, Germany, the cruise line is set to build its most innovative ship to date. Due for delivery in April 2018, Norwegian Bliss will be the cruise line’s sixteenth ship, third ship in the fleet’s Breakaway-Plus class, and first cruise ship custom built for an ultimate Alaska cruise experience. Her inaugural summer 2018 season will feature calls in Seattle, Ketchikan, Juneau, Skagway and Victoria, British Columbia for a 7-day Alaska cruise. Beginning November 2018, her 7-day Eastern Caribbean sailings will include stops in St. Thomas, Tortola, Nassau and Miami. Check back with The Cruise Web for more updates on the ship’s christening, additional itinerary and features/amenities. 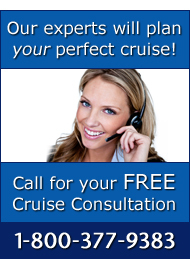 For help planning a cruise aboard Norwegian Bliss, call our expert consultants today at 1-800-377-9383.